When you hear about dark or stuck energy, does it make you uncomfortable? What about cord cutting? When I first began doing energy work, these things made me uneasy. I had sensed these things in others energy fields for years, but didn’t know what they meant or what to do about them. As I learned more, they became less frightening. Dark or stuck energy often appears as a thick brown or black cloud in the aura or body of a person. It is simply an area where not enough energy or life force (light) is flowing through. These can often be seen by sensitive people in other places as well, such as houses or other buildings and most objects that people and living beings have been active around for any length of time. Dark, stuck energy is not a scary as it may sound. It is simply an energy that didn’t flow through. It got caught and became stagnant. It may have been a very difficult emotion that the person was unable to process fully that got stuck in a repetitive loop of thought-emotion-thought. These can become lodged in the tissues and cause illness, which will appear as darkness. Negative emotions are very constrictive in nature. When they are experienced and then released, there is usually no blockage and energy continues resumes its normal flow. But when there are repeated negative emotions, or when thought patterns become such that the person remains stuck in processing the old emotional pattern, the emotional energy can’t flow through and release. The pathway remains constricted and becomes blocked. We can become caught in patterns of thought or in relational patterns that are destructive or that once served to keep us healthy or safe, but are no longer needed. If we continue to operate out of these old patterns due to fear or habit, they can generate stuck and dense energy as well. These dark energies get stuck in our energy field and lock in the pattern, keeping us stuck there and making it harder to break free and often making it difficult to even recognize we are stuck. These dark densities can sometimes seem to take on a life of their own, which is when they begin to be referred to as entities. This is when we have given an energy power over us for so long that it has its own strength. We empower many emotions and thought forms in this way. Those who are involved in highly charged and unhealthy thought patterns may be unwittingly empowering entities in their energy field and the environment around them. These entities are mainly made of and fed on emotional energy and the negative emotional energy that charges these individuals and family situations is what keep them alive. When the situation is healed, they have nothing to live on, so they leave. This sounds a bit frightening, but the truth is nearly everyone has some degree of entities around them and in their field. We are all working toward the light. While these entities can become very controlling and nasty in some cases that is not usually what happens. If this does happen, you may need special assistance to remove the entity, such as a shaman who works with entity removal. However, healing the original cause is highly important. When densities appear, the channels can be opened back up so that the energy (light) can move again. Reiki or other energy work is helpful to do this. It is also helpful to remove the dark or dense energy blockage. 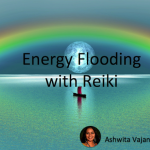 Reiki will reduce the size of a blockage on its own and most practitioners are able to see or feel a blockage and energetically “pull” it out. This may take more than one session for larger densities. Cord cutting brings to mind the idea of something painful. Or the thought that you will be removing yourself from someone or something that you don’t wish to be separated from. There is no physical cutting involved in the process. It is all energetic. It is actually the cutting away of unhealthy emotional energy that is stuck in a loop and can’t release. It keeps the person stuck and unable to break loose or think clearly for themselves. These cords can be found and cut with energy. The area is then healed so that a new cord is less likely to grow back and also to soothe the pain of the release. This does not end relationships. It may help soothe the pain of old tethers to a relationship that is already over and ended, but it will not end a healthy relationship. It may also end unhealthy attachments in an otherwise loving relationship, so that it may flourish. When you actively and honestly engage yourself in your own healing process, there is little to fear in the darkness. The healing process will not always be a pleasant or easy one, but if you commit yourself to it, the darkness will always come to light. Diane, you are quite correct about dissolved cords rather than cutting them. I have found this to be true fairly recently and have begun using this technique as well. And it is always important to fill yourself with light and surround the aura with light after doing this exercise, to seal the healing. Thank you for sharing that! Blessings to you! The best way to keep your home and life clear of negative entities is to release fear of them. It is also very important to tend to your own emotional processing, so that you don’t have stuck emotional energy in your aura and in your home. That will also help with releasing fears that you may have related to entities. Deal with any negative patterns within your relationships so that you learn healthier ways to cope with these. It is very helpful to clear out old energy in your home on a regular basis, as well. About twice a year, do a sweep through your belongings and let go of anything that you no longer use or want, especially if it has the energy of old or negative patterns related to it. Bless it for the purpose it has served in your life and let it move on to serve another or to compost to the Earth. Keep your home tidy and clean to keep energy flowing well. Open windows whenever possible and open blinds or curtains each day to let in light. You can also use sage, palo santo or incense to cleanse the energy of of a home, as well as your aura. Flower essence sprays work very well, too. Try not to be fearful about entities. They are made of our individual and collective emotional energy. The less you fear them or think of them, the less there is to magnetize them to your field. The higher your own energy vibration is, the more you will draw only light energy into your field. Lovely article! I’ve been trying this and constantly smudging my home and commanding these entities away from me but they seem to come back no matter what I do…. They sometimes take over my body and invade my space… I dont know what to do. I saw some psychics and some said I was just sensing them with my clairsentients and its not actually happening and a couple have told me im posessed. Help me please haha.